Vintage Hollywood 12x12 Paper Pad, 12x12 Patterns & Solids Paper Pad, 2 Chipboard, Tags & Pockets Die-Cuts, 8x8 paper pad, Ephemera & Journaling Cards, Black ATC Tags, Square Tags & Pockets Mini Albu, Square Deep Matchbook Box, Metal Drawer Pulls, Metal Lion's Head Knockers, and Vintage Hollywood Stamps, total value $135+. “Hey G45 Fans! I’m Katelyn Grosart and I live on beautiful Vancouver Island, BC with my boyfriend of 7 years. I’ve spent the last 8 years in the papercrafting world, working in a scrapbook store, as well as teaching a variety of classes. You’ll find me most of the time in my scrapbook room designing various cards, mixed media pages, scrapbook layouts, mini albums, and altered items. My all time favourite paper collection from Graphic 45 would be Botanical Tea, although Nature Sketchbook would be a close second. I’m a big Netflix watcher while I craft. My current favourite Netflix shows are: Grace & Frankie, House of Cards and Schitts Creek. I can’t live or craft without my fussy cutting scissors. I have 5 pairs just for fussy cutting in case I lose one in a pile while I’m crafting. Now that you’ve learned a bit about Katelyn, she’s going to share with you a new project. Check out How to Create a Mixed Media Sea Layout by Katelyn Grosart on Snapguide. Once your layout is put together, using white paint, add splatter marks over your entire layout. To add extra interest on your stenciled circles, rub on Opal Magic Wax in Blue and Green. Here’s something I learned while exploring this technique: Keep adding paint, stenciled images, stamped images and wax to the base page of your layout. It will get better when you continue to add different layers and elements. Voyage Beneath the Sea 12x12 Patterned Paper: Voyage Beneath the Sea, Neptune’s Adventure, Deep Blue Dreams, Aquatic Passage, Mermaid Melody, Steampunk Splash, Wild Waves. ...and thanks to Katelyn for sharing such a gorgeous layout. We hope we have helped get your week off to a great start. We have many more introductions to share with you this week. We are constantly amazed at and humbled by the talent of the Graphic 45 Brand Ambassadors. Stay tuned for more. We'd love to hear about some of your favorite projects by Katelyn in the comments below and remember that each comment is a chance to win this week's blog prize. Thanks for joining us again today, as we continue to reveal our brand new Graphic 45 Brand Ambassadors. We are so happy to get to introduce the oh-so-talented Einat Kessler. We will let her tell you a little more about herself in her own words below, and after that, be sure to check out the vibrant Voyage Beneath the Sea tag set she has created. 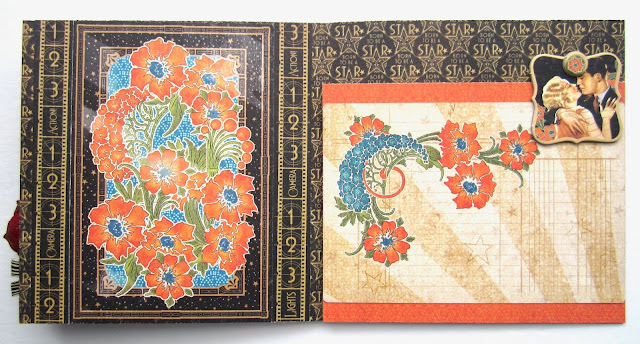 We love her seamless integration of stamped and fussy cut imagery from the collection, and the way the watercolor technique brings it all together. She also includes a SnapGuide tutorial for those of you who want to dive deep into this type of project. This week's prize package includes two 12x12 Off to the Races Paper pads, design and Patterns & Solids, Die-Cut Banners, Chipboard, Shabby Chic Metal Clock Keys, Black Regular Tag Album, and Celebrate ATC Ivory Tags, a $76 value! To enter to win this prize package just leave a comment here and/or on our Facebook page. The winner will be announced, Friday, June 9th. "I’m Einat Kessler, creative professional, mixed media artist, scrapbook and paper designer, altering enthusiast and class instructor from Israel. As a little girl I remember sitting in my grandparents living room with a huge scrapbook on my knees (I was only 6 years old so the scrapbook seemed larger than it really was), looking through the photos of faraway places my grandparents visited. As a master bookbinder, my grandfather built a new scrapbook from scratch for every trip he and my grandma took. After the book was ready he filled it with photos, postcards, images he cut from magazines, tickets and lots more. I thought it was pure magic. Years later when my first son was born my grandfather suggested I create a scrapbook for him. This was the first scrapbook I created. In those days there were no scrapbooking supplies in the stores here and I had to be creative and create everything from scratch. One day while online I searched the word scrapbooking and BAM!! A whole new world just gushed into my life! I was completely hooked! Slowly the new hobby took over my life until I decided to quit my job and open my own business. I started a blog, a Facebook page and a YouTube channel. Today my brand has evolved beyond scrapbooking to include mixed media, DIY projects, altering and recycling. I teach online classes and sell my creations on my Etsy shop. I’ve recently launched a members-only creative club with exciting video tutorials, tips & techniques, and amazing giveaways. I love sharing what I do with as many people as possible and the more I give the more I receive. I can’t create if there is quiet around me. So I always listen to music while I work. I wanted to install a TV in my craft room but my hubby said it would distract me from my work. I think he’s right so I’m sticking to music! It may come as a shock to you, but I didn’t like Graphic 45 when I started creating. As I developed and grew as an artist I started appreciating the complexity, the beauty and versatility of the G45 papers and completely fell in love with them. My first collection was Mother Goose. I really loved it and created several projects from it. I still save the leftover scraps of papers until today! When I sit down to create I can forget myself for hours. I don’t eat or drink or even go to the bathroom… That’s why I always have a bottle of water on my desk to remind me to drink. The reason I use a bottle and not a glass or cup is because when I keep dipping my dirty brushes in my cup of water instead of the cleaning water jar! In this project I decided to explore water colors with the Graphic 45 stamps. I used water colors before but this time I wanted to see if I could use them to create a background for the tags. I chose to use the Voyage Beneath the Sea papers because they match the sea water look of the water colors on the tags. I have a very modest set of water colors but that didn’t matter because I blended a few colors together to create more colors. After all the sea has so many colors of blue and green in it and the water colors capture that exactly because they blend so well together and they have a transparent effect that looks like water. The best tip I learned is layering. Yes you can layer water colors and you should if you want to create a water effect. Apply the first layer of water colors and then dry it. Once it’s completely dry you can add a second layer that will not blend with the first one. You can add more layers until you are happy with the result. Another tip is use the water colors properties to your advantage. Control the fluidity to create dripage or splatters. Mix colors directly on the paper while they’re wet and create gradual change of colors. Check out How to Create Water Color Tags by Einat Kessler on Snapguide. Thanks for joining us to celebrate another talented member of the all new Graphic 45 Brand Ambassadors. We are so lucky to have so many talented people creating with our paper, including all you readers out there as well. We hope you enjoyed Einat's story and creative dip into crafting with watercolors. We'd love to hear about some of your other favorite projects she has created in the comments below. See you here tomorrow for more Brand Ambassador introductions and keep an eye out today for a special bonus blog. Please join us in welcoming Aneta Matuszewska , one of our Graphic 45 Brand Ambassadors! Today, we will get to know what inspires Aneta's gorgeous creations and see one of her fabulous crafts, first hand. Aneta has mastered elegance and shabby chic, and it shows in her June themed card featuring Children's Hour, perfect for birthdays or weddings. We are so happy to have Aneta representing Graphic 45 and this project makes it easy to see why. "Hello my dear blog peeps, my name is Aneta. I am 40 years old, Polish, and I have been living in Iceland for almost 15 years. I’m the manager and owner of Retor Fræðsla, where I work as an Icelandic teacher. I am fluent in English and Icelandic. My scrapbooking fascination started about 5 years ago, but I have been deeply preoccupied with that for the last 4 years. I love light pastels, vintage and shabby chic, nevertheless I feel comfortable in any pattern. In my case everything is dependent on the kind of paper I can see on my desk, the topic of a card and finally my mood. I usually get inspired during my travels, on Instagram, Pinterest, admiring Icelandic nature and all the pretty little things around me. More fun facts about my crafting: I love to listen to some good music when I’m creating. Usually it’s a jazz or blues but sometimes I’m listening to a newest hits just to keep my mood going. I love to snack and drink when crafting. Sometimes it’s a glass of pure Icelandic water and sometimes I fancy a wine glass and a little bit of sushi on my table. I would like to share with you a very quick and sweet project. Thank you for joining in on the fun of introducing our new team of brand ambassadors, and a big thanks to Aneta for sharing her talents along with this bright, Summer card. Be sure to join us here daily as we continue to introduce the whole gang. You won't want to miss a single member's work and story. We'd love to hear about some of your favorite Aneta creations in the comments below, and remember that will also get you entered to win this week's blog prize. We are shaking things up here on the Graphic 45 blog to get your week started off on the right foot. In this post, we will announce this week's blog contest, feature a 3D Rose Box by Einat Kessler, and share a funky and fun wedding shaker card by Maria Cole. Our first featured project on the blog today is a fabulous gift box that will bring smiles to all who see it. Einat has gone wild with fussy cutting roses from our Portrait of a Lady collection and arranged them so beautifully using an easel technique. 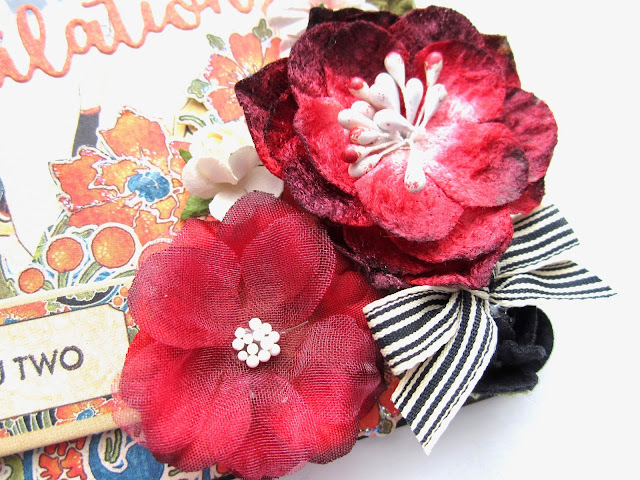 Following this lovely bouquet box, we have a wedding card that will surprise and delight any newly wed couple. Maria has gone above and beyond to personalize this wedding card for the recipients, and it has not gone unnoticed. 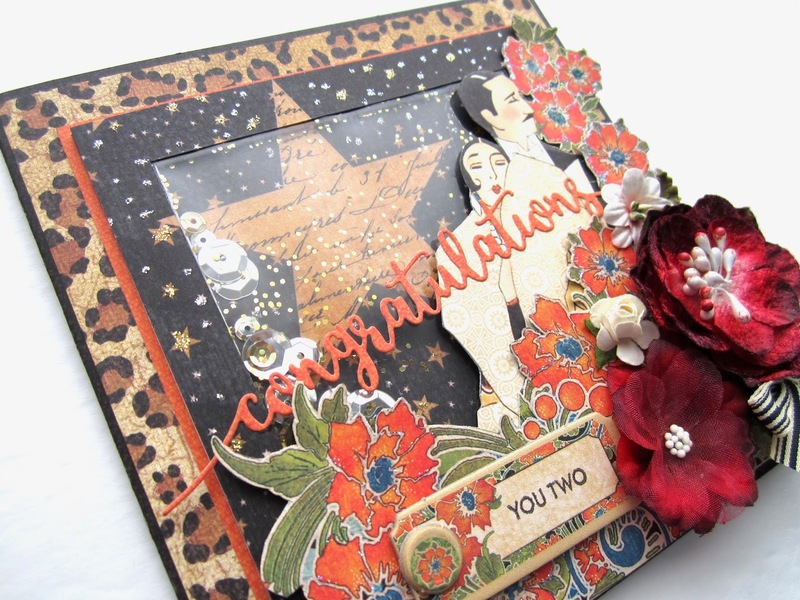 We just love how she has mixed and matched our Vintage Hollywood collection with Safari Adventure to create this beauty. Let's kick this week off with a thrilling blog prize. 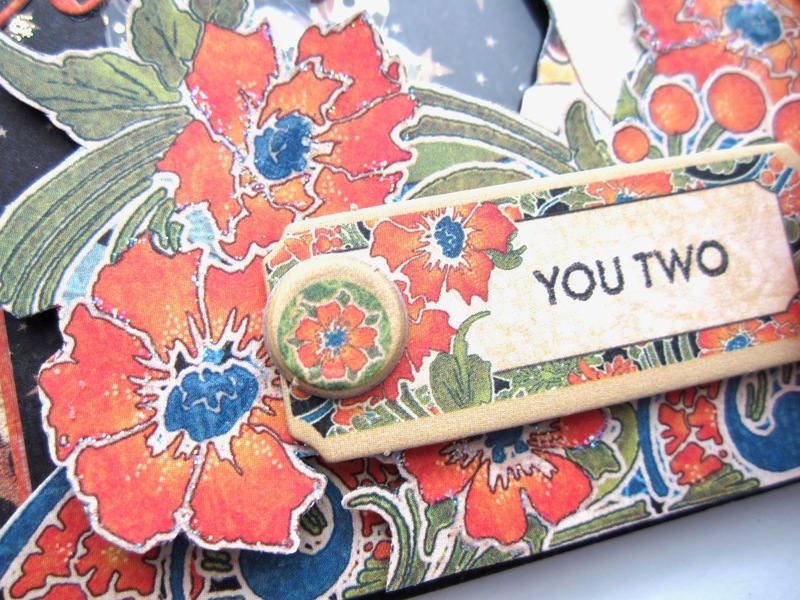 This week's prize package includes two 12x12 Off to the Races Paper pads, design and Patterns & Solids, Die-Cut Banners, Chipboard, Shabby Chic Metal Clock Keys, Black Regular Tag Album, and Celebrate ATC Ivory Tags, a $76 value! To enter to win this prize package just leave a comment here and/or on our Facebook page. The winner will be announced, Friday, June 9th. To make a cut-out image “stand” create a small easel that can be glued both to the image and the surface you want it to stand on. Create the easel from a strip of paper and simply create a triangle. The base will be glued to the surface and the image to one of its sides. When creating a box use the same paper. Use the one side of the paper to create the bottom of the box and the other side to create the top side or lid. 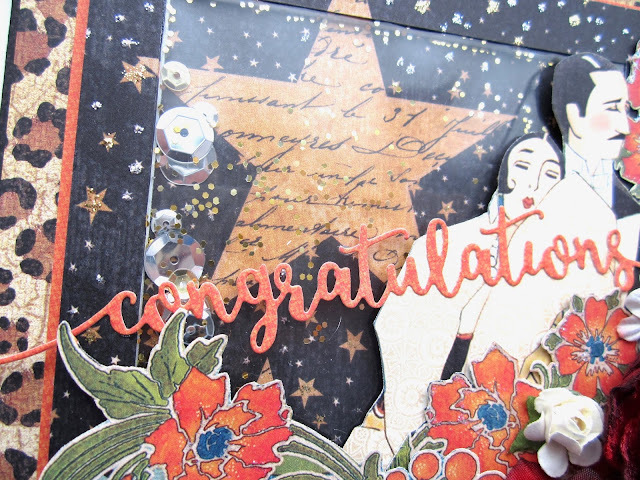 "Today I am sharing a wedding shaker card I made using one of Graphic 45's newest paper lines, Vintage Hollywood! This beautiful collection is all about glamour and stardom with some tributes made to early film stars like Mary Pickford. 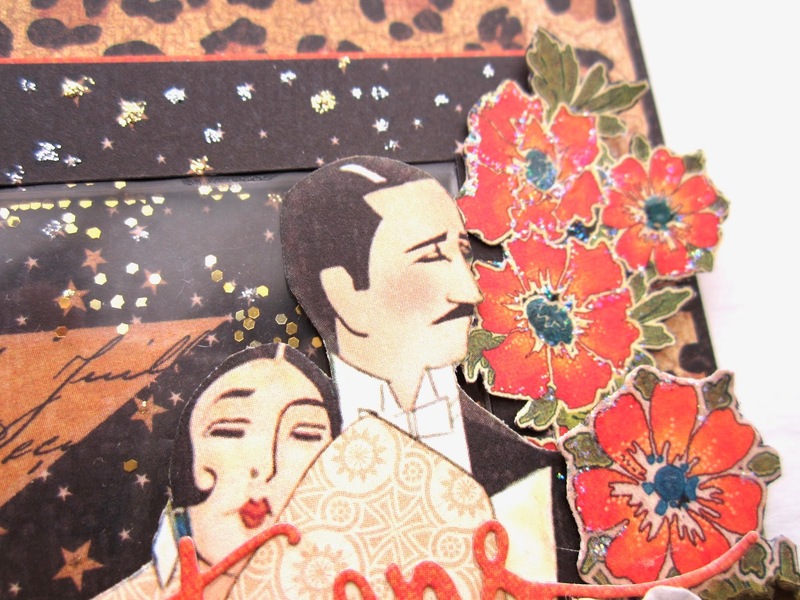 But did you know, Vintage Hollywood also makes for a wonderful wedding card? I have this special friend I made through Instagram. We share a love for Parson Russell Terriers, so naturally that's how we met! Anyhoo, she got married recently so I wanted to make sure she had a special card from my PRT Archie (@archie_prt on IG) and me. My friend loves Disney. And I remember that she loves cheetah print. So I was in a bind because 99.99% of my paper is Graphic 45 (actually - who's calling that a bind? That's more like the world's best blessing, right? ;) and with Disney being licensed, we don't have such paper. But I got to thinking and remembered there is a beautiful cheetah print design from Safari Adventure. 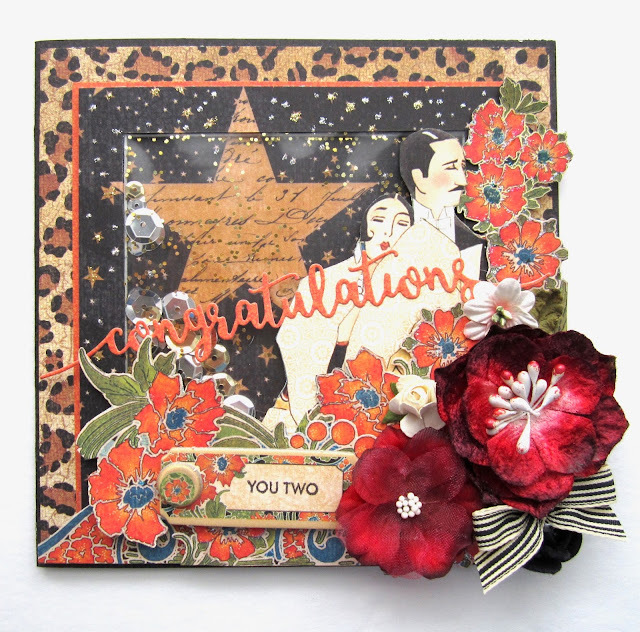 And then there were those fabulous star and couple designs from Vintage Hollywood ... oh, and some beautiful red Petaloo flowers I got for Christmas. What a fun collection to honor the next "it couple." :) So I made a shaker and added some sequins and gold glitter for an extra celebratory touch. The "congratulations" die is from Avery Elle. Any black and white striped ribbon is a winner in my book. May Arts is where this lovely ribbon is from. Inside the card, I used some of the matching ephemera cards. They are so beautiful. On one side you have a design and the back features an area for you to write on. You'll see that I also added some matching chipboard from Vintage Hollywood. Thank you for joining us for this uniquely refreshing post. We hope the projects, tips, and contest have inspired your creative mojo. Be sure to leave your feedback here and/or on Facebook to be entered to win! Have a great Monday, and be sure to share your projects with us on Facebook and Instagram using the #Graphic45 hashtag.